Learning how to measure social media success all begins with your core goals and what your business wants to achieve. Nobody but you can determine your own success without some sort of end goal in mind. For several brands on social media, goals revolve around increased engagement, new followers, faster response times or listening to social conversations more thoroughly. There are various social media analytics you can use to measure whether or not your efforts are paying off. What it boils down to is seeing a solid return on investment or increasing brand awareness through the digital sharing space. Depending on your business model, how you measure social media success differs. For example, the popular project management software company Trello, looked to increase Twitter responses to provide better customer service for inquiring and current customers. Through the help of a social media management tool like Sprout Social, Trello successfully increased its Twitter response rate to 97% for a 24-hour period. Additionally, the company increased Retweets by 49% to drive further engagement with prospects and current clientele. But overall goals change with the needs of each unique brand. For instance, Tito’s Handmade Vodka put some of its base goals toward Instagram. The company wanted to see higher engagement and further brand reach with help of Instagram’s growing popularity. In four months, Tito’s Handmade Vodka grew its Instagram engagement by 37%, driving more conversations on the visual app. While each network certainly has its challenges, it’s up to the brand to set measurable goals for success. There are different avenues to take to measure and actually see your social media success. Different metrics, demographics and post habits can give you deeper knowledge of how well your social media marketing performs. 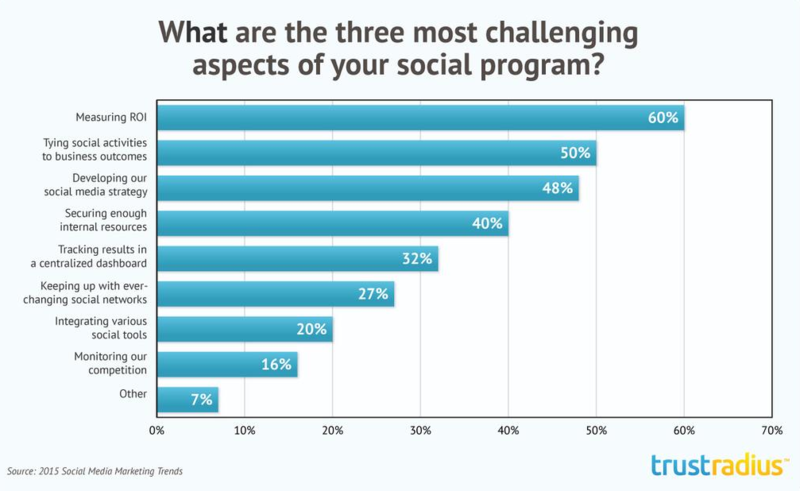 The problem is many brands aren’t answering the right questions when it comes to social media. 1. Do You Understand Your Social Media ROI? In a survey from Trust Radius, 60% of brands said their biggest struggle on social media was successfully measuring ROI. For any brand who wants to see if their social strategy has an impact, you have to know how to measure social media ROI in the first place. Cost of different social tools: Social media management tools like Sprout allow you to track, monitor and measure your social efforts. 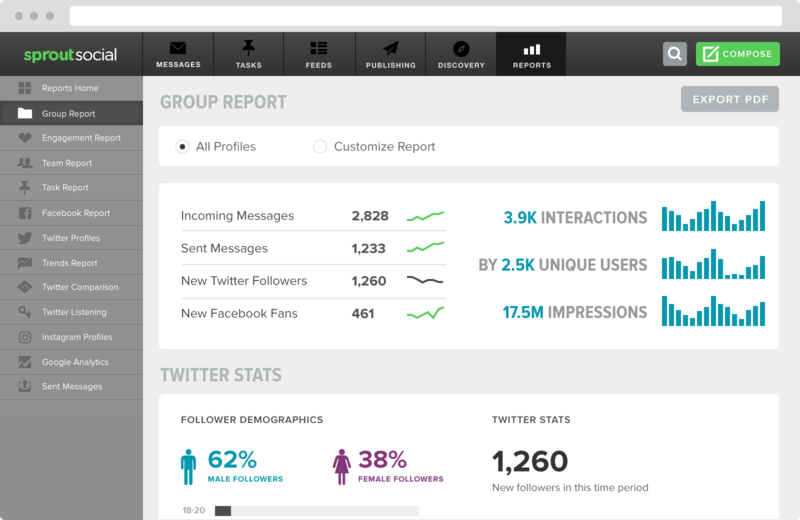 The total costs of social tools should go into your ROI configuration. If you don’t have a tool yet, try Sprout Social for free for 30 days! Total man-hours logged: Whether it’s a customer service representative or digital marketing associate managing your accounts, ensure you know the total man hours going into your social media strategy. Paid content & optimization: The content you produce on your blog or on social needs to be tracked as well as the expenses going into this duty. If you have freelancers, copywriters or SEO specialists, make sure the cost going into each post is included in your spend. Paid social ads & post boosts: Organic social content is getting harder to promote, which means more are paying for post boosts and social advertisements. If your social media content is promoted through ads, include it in your ROI spend. (Earnings – Costs) x 100 / CostsFor example, say your weekly Twitter posts earn you $350 in revenue. Also consider your marketer spent a few hours promoting, writing and publishing content for the week, which turns out to roughly $75 in man work. Additionally, you spent $100 promoting the post on Twitter for the week. 2. Does Your Content Perform Better on Specific Networks? Now that you have the basics to understanding your ROI, it’s time to measure your content. Whether you’re sharing a blog post, a product update or a new deal on your social networks, you need to know how well your content performs. Paid vs. Organic Likes: Do you know the difference between paid and organic Likes on Facebook? Do you have a tool to separate and measure between each post? Impressions: How often do users see your posts? Have any of your posts seen multiple impressions from the same user? Reach: For your Page post on Facebook, it’s important to see the reach, or the total received impressions (per person since one user can count for multiple impressions). Mentions: Do you know how often your brand is mentioned on each of your target networks? Does any piece of content drive more mentions than others? Post Clicks: How many times has a user clicked into the post and engaged with your content, instead of just scrolling by. Link Clicks: Have any users clicked on your link from a specific social media post? Profile Visits: How many people have clicked through to your profile from a specific post? Replies: Do you know the total amount of users who have replied to a single post? Can you measure it next to all your other content? Engagement Rate: At what rate are users engaging with your content versus the total impressions? Even though these metrics just scratch the surface, if you can’t answer definitively, you’re not doing enough. Through Sprout Social’s social media analytics and reporting features, you have instant data to these questions and more. Be confident in your analytics. 3. Has Your Follower Count Increased During Your Social Media Strategy? Other metrics that are critical to your social media marketing strategy include data about your follower count. It’s important to know if your content drives, defers or does nothing to your over follower count per network. Audience growth trends give you better insight into your social media publishing habits. Through a detailed graph, your overall audience growth shows you which pieces of content brought the most new followers to your networks. 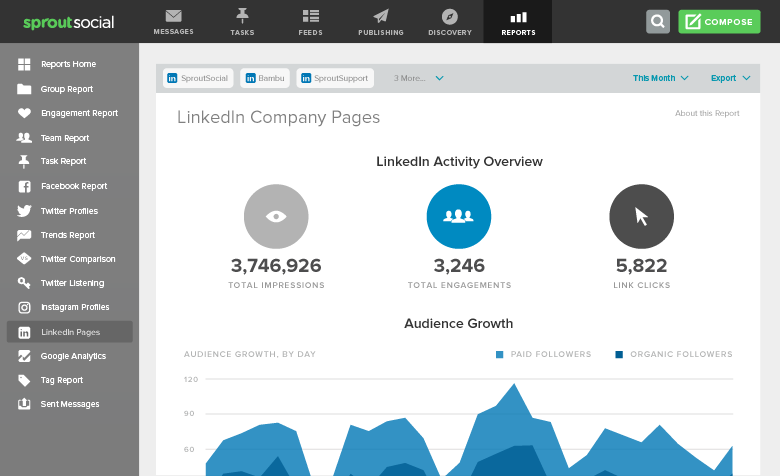 Did a major event such as a product update drive more followers to your LinkedIn update? Through follower trends reporting, you can easily see if your marketing team did enough external promotion to drive awareness of your brand. With Sprout, you can even dissect your followers from organic and paid to see just how users got to you in the first place. 4. Do Your Social Demographics Differ from Your General Audience? Your social media demographics can change per social network and even possibly from your overall brand demographics. Tracking your demographics can help you see how successfully you’re reaching your core audience. If you’re selling men’s grooming products, but see your Twitter demographics is predominantly showing a female follower base, you’ll want to know what content drove this factor. Is the demographic purchasing the product or is there no link to your core demographics and social media followers? In the event you need to rework your social media demographics strategy, ensure you track your followers through time to ensure your content reaches the correct consumer. If you don’t evaluate who’s following you on social media, there’s little chance to increase overall success. 5. Do You Know What Customers Truly Say About You? No matter what you do, if you’re a brand, people are talking about you on social media. While it’s not always a plethora of good comments being said about your brand, monitoring your keywords and posts about your company can help address issues much faster. Brands have to stay up to date on customer interactions and data even shows many are faulting at having good response times. According to the Sprout Social 2016 Q1 Index, brands are only responding to roughly 11% of social messages, which is a drop from 13% in Q4 2013. Not only are response rates dropping, but consumer expectations are increasing. The report found nearly 43% of consumer messages to brands need or deserve a response. However, you’re not always going to be lucky to see every person that mentions or shares their concern with you. With the help of social media monitoring tools, you can easily see what’s being said about your brand with keyword searches. Are customers happy with your latest release? 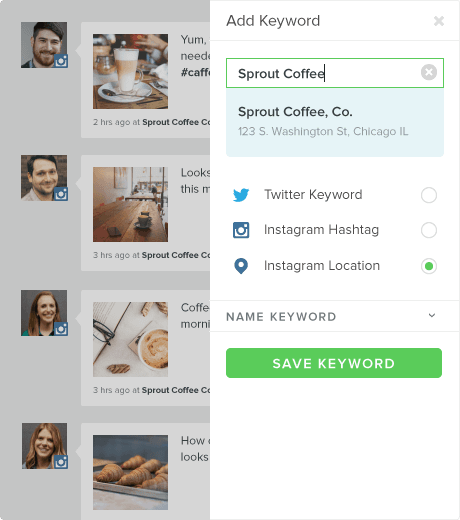 Use Sprout’s keyword monitoring tools across your social channels to see what consumers are saying. Increasing your response rate, even if they didn’t directly mention you, can dramatically boost loyalty in consumers. Once people know you care and take the time to respond, the chances of them coming back rises. Being a successful brand on social media takes time, but you have to put in the effort to see results. Simply hiring a social media manager with no goals or direction can lead to wasted time and money. Again, progress takes time, but increasing what you measure and how you do it can expedite the process. Make sure you know your top performing content, social media networks and other tactics that help you build your audience and brand awareness. It might seem difficult, but that’s why we’re here to help. 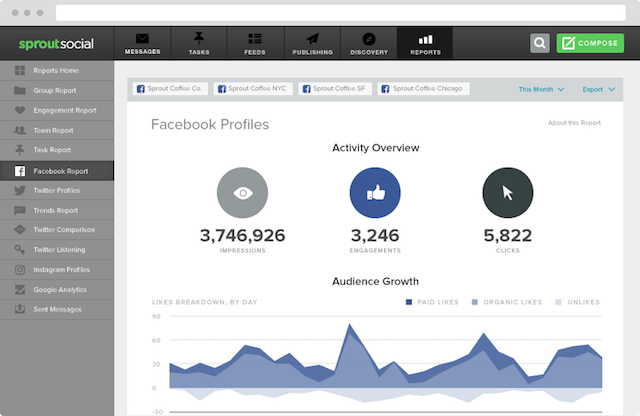 Sprout’s social media monitoring tools allow you listen, identify and track your most crucial social data. Taking this step will directly help you discover just how well your strategy is paying off.